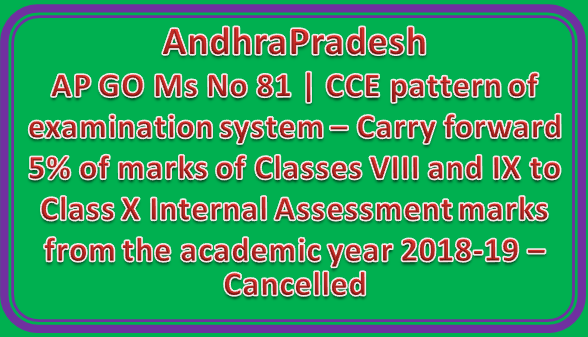 School Education Department – Continuous and Comprehensive Evaluation pattern of examination system – Carry forward 5% of marks of Classes VIII and IX to Class X Internal Assessment marks from the academic year 2018-19 – Cancelled – Orders - Issued. 1. G.O. Ms. No.82, School Education (Prog.II) Dept. 3. In the circumstances reported by the Commissioner of School Education, A.P. Amaravati and keeping in view of the recommendations of the workshop held on 29.05.2017, after careful examination of the matter, Government hereby cancel the orders issued vide G.O.Ms.No.12 School Edn (Prog.II) Dept., dated: 25.02.2016 and G.O.Ms. No.32 School Edn (Prog.II) Dept., dated: 24.05.2016.